1. What respirator do I need to wear? 1. Chemical cartridges and canisters, which adsorb or absorb gases and vapors. 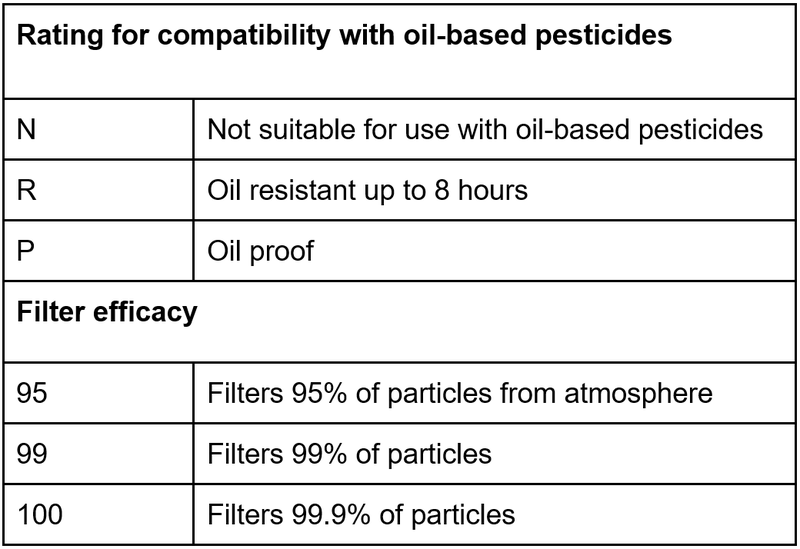 Most pesticide labels with a cartridge requirement require an Organic Vapor or OV cartridge, color coded black. Be sure to check the label closely as a few pesticide labels require a different cartridge type. 2. Filtering respirators, which remove solids and liquids suspended in air. These are much more commonly required on pesticide labels. If the label requires a filtering respirator, it will specify a letter, and sometimes a number. The following table explains this system. In many cases, a label will say “Any NIOSH approved N, R or P filter”. If this is the case, any 95, 99, or 100 filter will be acceptable. A100 filter will provide more filtration, but will also be harder to breathe through and could cause elevated blood pressure or difficulty breathing. 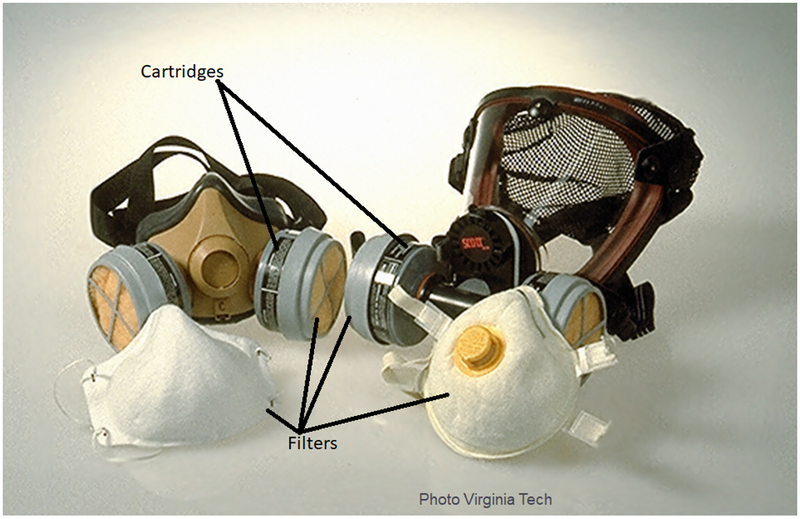 The photo below shows four different types of respirators: two filtering facepieces, a half-face respirator, and a full-face respirator. All of these respirators can work as filtering respirators, but only the half-face and full-face respirators can carry a chemical cartridge. 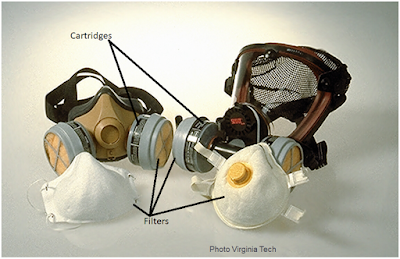 A fit test will help you determine which type of respirator is best for you. The half and full-face respirators below have the capacity to hold both cartridges and filters; other half and full-face respirators are available without cartridge attachments. **Any respirator you wear should be NIOSH approved. The National Institute of Occupational Safety and Health tests respirators to ensure that they protect the wearer to the degree that they claim to, and is the only trusted certifying agency or organization. Respirators can be purchased from the following sites. The University of Minnesota does not endorse any of the following, they are simply examples of where respirators can be found. *Tip for navigating these sites: There will be many respirator options on these distributor sites, which can be difficult to navigate. If you know the type of filter you’re looking for, type the code into the search bar (e.g. “P100”). 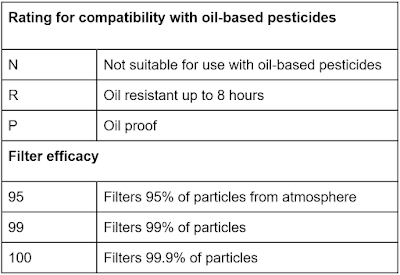 If you find the correct filter, the description will usually list the corresponding half-face or full-face respirator. 2. Is it safe for me to wear a respirator? While respirators are meant to protect people, they can pose a health risk if you have high blood pressure, asthma, claustrophobia, etc. Wearing a respirator puts extra strain on your lungs and can cause your blood pressure to rise. 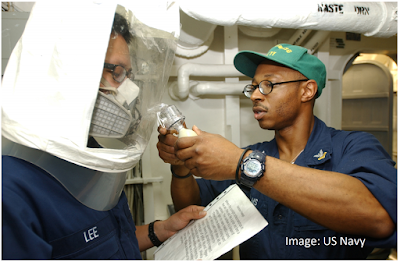 As such, the National Institute for Occupational Safety and Health (NIOSH) tends to suggest the least invasive respirator needed to keep the wearer safe. Before you can wear a respirator or be fit tested to wear a respirator (see #3 for fit testing), you must pass a medical evaluation. Check with your local clinic to see if they offer this service. If not, evaluations can be done online. One provider that 3M's respirator team recommends is respexam.com. (Click “Sign up today” at the bottom of the page. If you are a farmer, indicate your farm’s name or your own name for “company name”). 98% of people will receive clearance through the online system. 2% will be instructed to see a health professional in-person, and the online system will provide instructions for the health provider. This online exam takes approximately 35 minutes to complete. ***If for some reason you are not given medical clearance, you are protected by the Worker Protection Standard. It is illegal for an employer to terminate employment, reduce pay, or punish an employee in any other way due to a failed respirator medical evaluation. 3. What is fit testing? And where can I get fit tested? The Worker Protection Standard requires that everyone using pesticides that require respirators must be fit tested annually, or when any change occurs to your face shape occurs (i.e. weight changes or traumatic accidents). For qualitative fit testing you’ll wear your respirator under a hood. After determining you can taste the test agent, someone will pump a sweet or bitter tasting substance into the hood and ask you to perform a variety of facial movements. If you can taste the substance, you’ll have to adjust your respirator or try a new model or size until you find one that prevents you from tasting the substance. 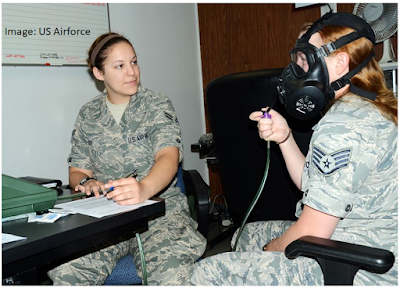 For quantitative fit testing, a sensor will provide a numerical reading on the amount of leakage into the respirator. As with qualitative testing, you’ll have to adjust your respirator or try new models and sizes until you find one with a sufficient rating for your face size and shape. Your fit testing provider will often have samples to try, and can give you the details on where to buy the model that you are fitted for. Fit testing can be difficult to find; check with your local cooperative or agricultural chemical distributor to see if they offer fit testing. We will be posting a resource map soon with other locations around the state that offer fit testing. Regularly inspect your respirator for tears, cracks, distortion, dirt, missing parts, and other damage. Inspections should include straps, inhalation and exhalation valves, and all other plastic parts of the respirator. Changing filters and cartridges: Under the Worker Protection Standard, respirator filters and cartridges should only be worn for 8 hours. If you only wear your respirator for a few hours at a time and want to wear it again later, keep it in a clean place away from where your pesticides are stored. If you are using an organic vapor cartridge, keep it in a sealed plastic bag between uses, as it will continue to absorb contaminants in the air. Cleaning and storage: After each use, remove the filters and cartridges. Clean your respirator with warm water (not exceeding 50 degrees C / 122 degrees F) with simple detergent solution. Detergents should not contain lanolin or other oils. Using a soft brush can help to remove residues. After washing, soak your respirator with a disinfectant such as 30 mL household bleach, diluted in 7.5 L of water. Rinse in warm water and allow to air dry. Store your respirator away from contaminated areas.